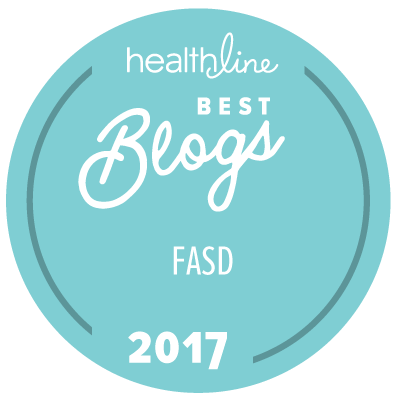 We have been trying to work on ways to help our 12-year-old son with FASD to release tension. As the pressures build with the end of the summer and the beginning of school coming, he has been finding it really hard lately. A specialist reminded us of the progressive muscle relaxation technique – tensing muscles and then releasing the tension. He gave the example of holding hands out – pretending to squeeze lemons and then releasing them or pretending to be a turtle, squeezing your shoulders up to put your head in your shell and then relaxing them. Recently, during an out of control moment, I surprised our son and redirected him by introducing this idea again and giving him some additional physical input. It started by making a pillow sandwich on his bed with lots of pillows – then we gave it a twist by telling him he was melted cheese. By the time we were done he was giggling and thinking of different foods that start off hard and then become soft. As he was acting this out, I was encouraging him to tense his muscle groups and then massaging them and helping him to release the tension…it was surprisingly fun and certainly better than the full on aggressive meltdown he had been having before we started ‘playing’. Pretend you are the cheese on a ham and cheese toastie. The cheese starts off solid (tense all muscles) and then melts (relax all muscles). Pretend you are a piece of spaghetti – stiff and straight until you go into the pan, and then you go all loose and squiggly and get curled up onto the fork. Pretend you are a sausage in the pan, all straight and solid. Sizzle as you cook and then pop! Pretend you are the ingredients for ice cream – we stir you up (head to toe quick shaking). Then you go frozen solid. We take you out of the refrigerator, and then you start to melt. Pretend you are the cheese on pizza as it cooks – starts off solid and then gets all loose and melts everywhere. Pretend you are the cheese in a burrito – wrap up in a blanket, tense, and then pretend you are cheese melting. “This process of relaxation is guaranteed to happen because it is based on a principle of muscle physiology. Whenever you create tension in a muscle and then release the tension the muscle has to relax. The muscle does not have a choice. It must happen. The interesting aspect of this process is that the muscle will not only quickly relax back to its pre-tensed state, but if it is allowed to rest, will become even more relaxed that it was. As this procedure of creating tension and then releasing it is applied to every major muscle group of the body, all of these muscles will become more relaxed than when you started. We also are teaching our guy to take some ownership for figuring out his needs, and helping with strategies when he starts to feel unhappy. You may have seen the earlier post, SuperT: How to go from angry to happy, which includes a video he made advising other kids, and where used we emojis as aides. Recently he made two more videos – encouraging kids to go outside if they are having a bad day. We are improvising as we go along. Sometimes it’s easy to forget that we adults have a role in teaching techniques that will help our kids get through these moments. Sometimes around here we find the days so pressured that we take short-cuts, we feel the weight of it all so heavily that we forget that having fun is also therapeutic.